Singletrack that crosses creeks and roads. Out and back, 7 miles one-way. Some doubletrack. There are some sections, like creek beds, that almost all people will hike-a-bike. Rock outcrops and loose rock in some sections. Very taxing trail, bring water and enthusiasm. Don't bike alone, and sign in at the trailhead. Plenty of bugs (yes...ticks too). Review: The Old Military Road Trail partially follows the road that was built by the military in 1832 between Fort Smith, AR and Fort Towson, OK. Many features of the original Military Road can still be seen from the trail just north of the picnic area. This old road also provided access to settlers in the area and wagon trains headed west. This is a more difficult trail where it climbs Winding Stair Mountain. Boardstand and the Old Military Road Trail is marked with White Rectangles; Blue Rectangles mark the Ouachita National Recreational Trail. Recommended Seasons: Autumn through Spring. Review: I rode this again in July, 2005 and it was still sweet. I was expecting it to be hot, but it wasn't too bad because the trail is mostly shaded. Its still rocky with some very technical climbs and downhills, and an epic climb from Holson Valley Road to Tahlihina Scenic Drive. It's still a bomb back down. The only summer drawback is that about 0.5 miles of the section closest to Talihina Scenic Drive was overgrown, but still rideable. Similar Trail: Indian Nation Trail, the trails in Clayton Okla., Turkey Mountain, Greanleaf State Park, Earthquake ridge (AR). Review: Excellent trail! If your doing the entire out and back, start at the Holson Valley Rd. trailhead. Then it'll be mostly up one way, and down on the way back. If you're doing only one way, start at the HWY 1 trailhead (or and extra 0.5 miles at the State Park). 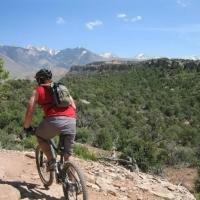 You can also ride the HWY up, and ride the trail back down. Bring extra tubes and tires-lots of sharp rocks. I rode in February with cool weather, little undergrowth, and no ticks!!! Trail is well marked. Plan for 3-5 hours. 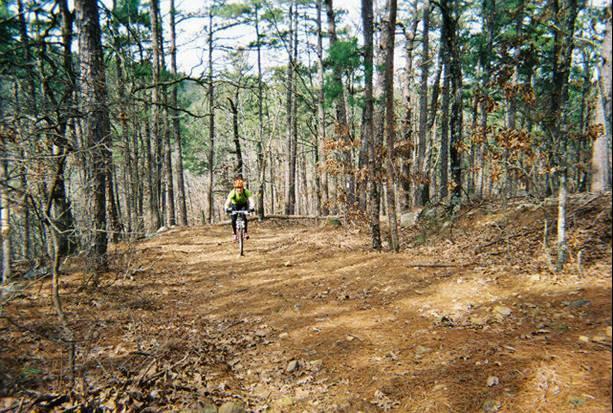 Similar Trail: Other Ouachita Mountains trails. Old Military Road Trail MTB Trail 3.33 out of 5 based on 6 ratings. 6 user reviews.